Once, Walfurgisnacht was not in ruins, but much more magnificent. The present-day Ruins of Walfurgisnacht are decaying structures that are stabilized by some unseen force. Though there are Zuma living around the area, the ruins are unsuitable for normal habitation. Different parts of the ruins contain different secrets. Though it is believed that Walfurgisnacht was once a nexus of magical energy, remnants of some supernatural power can still be felt in the blackened stone and the rotten wood. And though the ruins appear abandoned, strangely outsiders cannot enter, finding themselves repelled by something unseen, and confronted by a Zuma priest. Whether this priest always appears the same, or whether the priest is truly human is a question that can only be answered by the individual who experiences such a phenomenon. Once passage is granted, one might find that the interior of the ruins is flooded in darkness. Some areas are so dark that no light, however bright, can illuminate even enough to see one's hands. Faint whispers can be heard coursing through the walls, and in the solitude of darkness and voices that do not answer back, madness is the usual fare. Death is often the only solace, and even that is not guaranteed. An eerie and bizarre place to be certain, it is said that those who still live in the dark ruins practice forgotten and dreadful rituals that once gave the tower the name "Walfurgisnacht", Witches' Night. Overlooking the western ocean, the ruins enjoy sea breezes nightly. At times the Volcano Nightscree will drop ash on the region, but the ash is usually blown away by morning. Being so close to the ocean, precipitation can become heavy, especially during the summer months. Temperatures also remain fairly stable. The Ruins rest at the point where the ashen lands of Volcano Nightscree meet the western coast. Land is rough, but fishing along the coast provides for food. 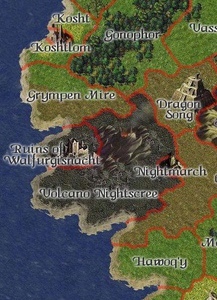 The earth around the Ruins is black, but it is not due primarily to the Volcano Nightscree, but to something sinister underground. "Desolate...a castle that once was so strong now rubble. Towers that were once over 400 feet high, crumbled. Only 8 living inhabitants remain, one isolated family, that was probably once noble. Whatever did this to the once great city, has surly indescribably destructive power." "The lucky soldier who rose to become a noble and single-handedly transform the Artemis family was said to have died, but my family has many runners throughout the lands, and one of them brought me something I find most intriguing. Jeherad's diary, written under his adopted name Jared Artemis, so happened to fall into my hands. Here I could at last know whether my dreams are true. I have been unable to decipher any more up to this point. However, it is my belief that Jeherad managed to get lost and stranded on the western coast of Dwilight before it was widely known. From what I can tell, he took shelter in the castle, or what remained of it, with some natives. My research on this place has turned up what people have heard a Genghis Steel say regarding the place, and somehow, someday, I must find those 8 remaining people and find out what they know." This page was last modified on 3 March 2017, at 11:53.